One of the most frequent questions we are asked is "where can I recycle alkaline AAA, AA, C, D or 9 volt batteries?" The bottom line: Alkaline Consumer Batteries are not recycled. The short answer is to what to do with them, to be protective of the environment is put them in your trash� or drive them to a place where they will put them in the trash, and you get to feel like they were recycled. If feeling good is your goal, this page will help you find such a place. Alkaline batteries are a challenge most places to recycle. First, no one actually �recycles� them. If you think you know of a facility that genuinely accepts consumer alkaline batteries from consumers and does truly recycle them, do tell us - we're pretty certain there are none. Used alkaline batteries are pretty worthless, economically speaking. Even Earth911 says "There has been debate about recycling single-use batteries and whether or not it�s actually cost effective. Each individual battery contains a small amount of reusable material, including zinc, manganese, and steel." Years ago, the mercury that made them hazardous was removed from the manufacturing process, so while we would not recommend eating them, putting them in a fire, or breaking them open... they're pretty innocuous. Since the mercury content of alkaline batteries has been reduced, they can be safely disposed of in household garbage. They are accepted via IKEA and some hardware and home improvement stores in small quantities. Rechargeable Battery and Cell Phone Drop-Off Locator--Find where to recycle used rechargeable batteries from the Call2Recycle Web site. Earth911.com--or call 1-800-CLEANUP (1-800-253-2687), a service of Earth 911, to find the nearest recycling center. Includes information about most recyclable household waste, including household hazardous waste collection centers. eRecycle.org--Recycle your batteries and electronics. Where Can I Recycle My...?--Call 1-800-CLEAN-UP (253-2687) or enter your ZIP code at this Web site to find the nearest recycling center. Includes information about most recyclable household waste, including household hazardous waste collection centers. Local Governmental Household Hazardous Waste Agencies--See the Web site for your local governmental household hazardous waste agency for the latest information in your area. The Big Green Box--The Big Green Box� is a national program that offers companies, consumers, municipalities, and other generators, a low cost, easy, and flexible way to recycle their batteries and portable electronic devices. Once The Big Green Box� is purchased, all shipping, handling, and recycling fees are included. The Big Green Box� includes a UN approved, pre-labeled container, pre-paid shipping to and from the recycling facility, and of course, all recycling fees. Battery Solutions--Battery recycling solutions for businesses, governmental agencies, and consumers. Retriev Technologies Inc.--A company that recycles most types and sizes of batteries including alkaline, Lithium, Mercury, NiCd, Lead and many others. Kinsbursky Brothers Inc--A U.S. Environmental Protection Agency permitted battery-recycling facility in California. Like people are going to drive to some center when they have 2 AA batteries to get rid of. This type of misguided overregulation will lead to more improper disposal. Regulators should seek to make doing the right thing easier and cheaper...not adding burdens! What do other authorities say about disposing and recycling alkaline consumer batteries? Alkaline batteries can be safely disposed of with normal household waste. Never dispose of batteries in fire because they could explode. Due to concerns about mercury in the municipal solid waste stream, we have voluntarily eliminated all of the added mercury from our alkaline batteries since 1993, while maintaining the performance you demand. Our alkaline batteries are composed primarily of common metals�steel, zinc, and manganese�and do not pose a health or environmental risk during normal use or disposal. But what if you are still desperate to have your alkaline batteries recycled? One company (see Amazon box at right) offers a disposal by mail kit. 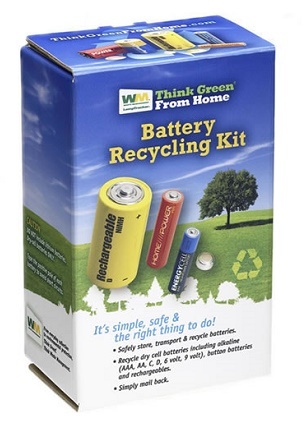 And the Think Green From Home Dry Cell Battery Recycling Kit provides a simple solution for household recycling. You can use the recycling box to store 9 volt and smaller used alkaline, carbon-zinc, NiCad, and NiMH batteries. The kit includes a pre-paid return shipping label, so when the box is full, simply seal it and place by your mailbox for postal pickup.